When it was released, the Galaxy S4 was available in 2 colors: Black and White, as simple as that. These weren’t going to be the last colors as Samsung decided to lighten things up by presenting 4 new colors: Blue arctic, purple mirage, red aurora, pink twilight. Now a leaked press image of a new color is showcasing the Galaxy S4 in Brown Autumn. 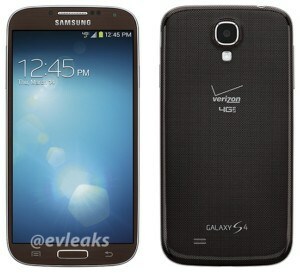 The press image was released by @evleaks, and it is showing that the color will be sold exclusively for Verizon users. The Brown looks really nice and it actually gives the phone a more classy look. We do not know for sure when the new S4 will be released for sale, but we are expecting it in the following days. You will probably only be able to get the Brown Autumn Galaxy S4 from Verizon by now but Samsung will probably releases it in the future with other distributors.